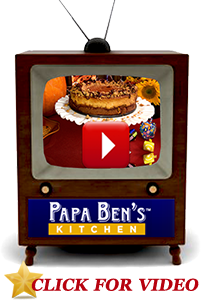 Papa Ben’s Kitchen recently had the great pleasure of welcoming celebrity chef Randy Fuhrman to help us create this amazing Spicy Pumpkin Cheesecake with Papa Ben’s Kitchen Spicy Chipotle with Ginger and Dark Chocolate Mandelbroyt Crust! 1. Pulse the cookies and brown sugar in a food processor until well combined and the crumbs are uniform. 3. First, mix with a spoon and then with your fingers until the mixture is evenly moist, crumbly, and holds together when you squeeze a handful. Press the mixture evenly over the bottom and partway up the sides of a 9-inch springform pan. 4. Chill for 5 minutes and then bake for 10 minutes in a 350 oven . Let cool. 2. With an electric mixer, beat the cream cheese until smooth. 3. In a separate bowl, whisk together the brown sugar, cinnamon, ginger, allspice, nutmeg, chipotle powder and salt. 4. Add this mixture to the cream cheese. Beat until well blended, scraping down the sides and bottom of the bowl as needed. 5. Add the eggs and yolks one at a time, making sure each is thoroughly incorporated before adding the next, and scraping down the bowl after each. 5. 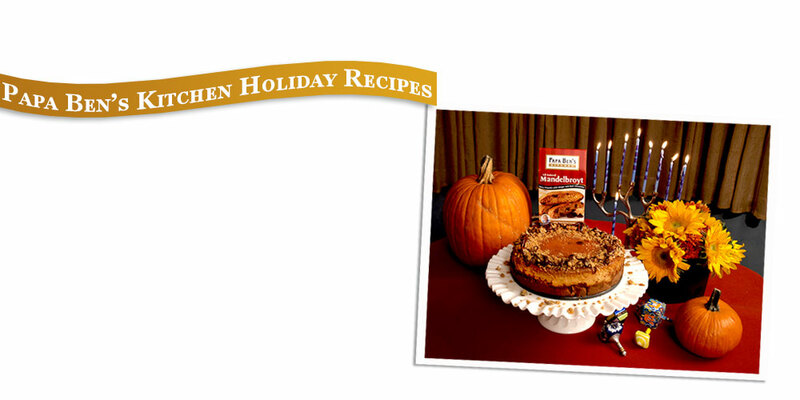 Blend in the vanilla , southern comfort and pumpkin until well blended. 6. Scrape the batter into the cooled crust. The batter will come up past the crust and will fill the pan to the rim. Tap the pan gently once or twice on the counter to release any air bubbles. 7. Set the pan in a larger baking dish (a roasting pan is good), and add enough hot water from the kettle to come about halfway up the sides of the springform pan. 8. Bake until the top of the cake looks deep golden and burnished and the center is set (the cake may just barely begin to crack), 1 hour 35 minutes to 1 hour 45 minutes. The cake will jiggle a little bit when tapped. The top may rise a bit but will settle as it cools. 9. Remove the cheesecake from the oven and run a thin-bladed knife between the crust and the pan sides (this will prevent the cake from breaking as it cools). 10. Let the cheesecake cool to room temperature in the pan on a wire rack. Cover and chill overnight. 4. Bring out 1 hour before serving and enjoy!